So, I'm not at school today - just too unwell! Ugh! I was up half the night and just feel totally rough. I've managed to sleep most of the morning but now I've been up an hour or so I'm starting to feel pretty awful again. Gonna have another sleep after I've written this blog post for you! Despite these last couple days being sick, I think I'm finally getting back into the groove of participating in challenge blogs! The last few weeks I've been a bit flakey and I've missed it. 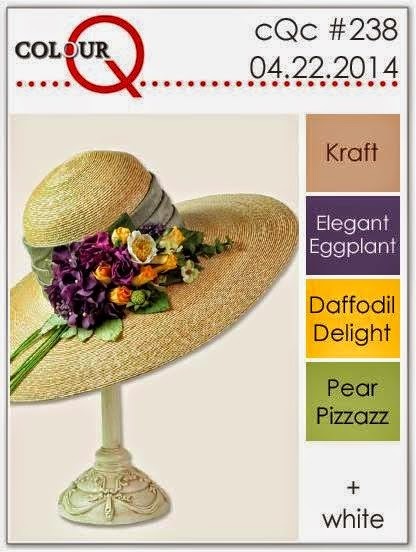 Today's share is the Colour Q challenge. It's a totally beautiful colour combo! Love, love, love purple and yellow together. ITs not a colour combo I use often but it just looks so bright, cheerful and fresh! It reminds me of crocuses! I wanted the elegant eggplant and daffodil delight to have a real colour hit on this card so I thought it'd be nice to do a big blossom with some little white and yellow flowers scattered around. 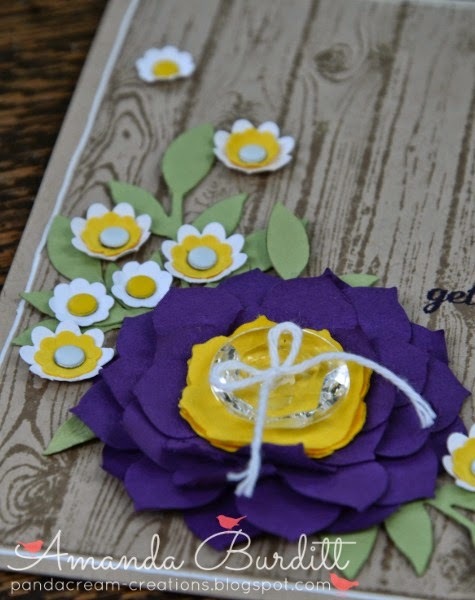 For this big blossom I used the blossom party die for the outer layers and floral frames for the yellow centre. I used the bone folder to split the card into 2 layers. I love the light fluffy texture it gives the paper. To give all the layers I scrunched the layers for that little variation in different sizes. For the centre two layers I actually cut the petals up into individual pieces and adhered as it kept the flower a little neater and flatter. I hadn't used the vintage faceted buttons in ages and thought it'd be the perfect touch here. It'd add that sparkle and wow to the card without taking away the punch of colour. I realise that I used a lot of candy dots here but they work so well for the centres of the little blossoms. Candy dots are certainly one of my favourite embellishments of the moment! The hardwood background adds the needed texture and seems to fit so well with flowers - like a wood panel fence. Okay, I need to get off for a sleep. Have a great day! Very pretty...reminds me of the hollyhocks that used to grown along the fence on our farm! Beautiful! Hope you feel better! Thanks for playing with the CQC this week! Absolutely love that woodgrain background...it sets off the flowers so well. Beautiful design too - thanks for playing along at Colour Q Amanda! 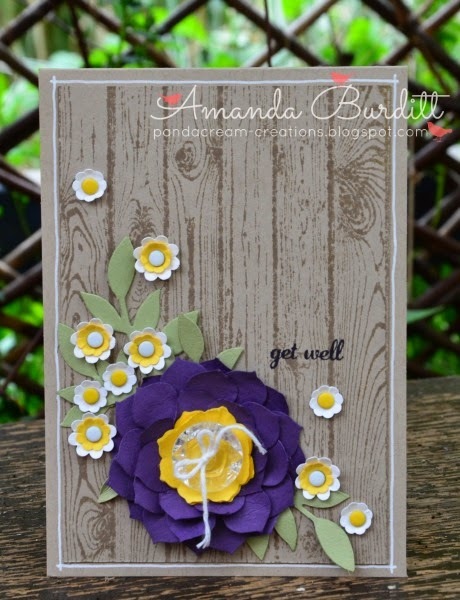 Such a lovely card, Amanda, love the contrast of the colors on your fence! Feel better soon and thanks for joining in the fun at the colourQ.